The 45.72m motor yacht Encore is available for charter in the Caribbean in late January, February and early March through Daphne d’Offay at Ocean Independence. Built by Trinity Yachts in 1998 and refitted in 2004, she is MCA and ABS compliant and equipped with zero speed stabilisers. 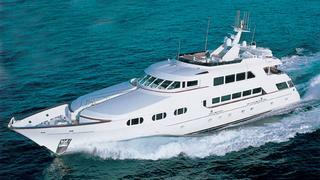 She features a Dee Robinson interior and sleeps up to 11 guests in five staterooms. Captain Roy Hodges and a dynamic crew of nine promise a fun time on board. Heading for the Bahamas in mid-March, weekly charter rates on Encore start at $160,000 in high season and $145,000 in low season.